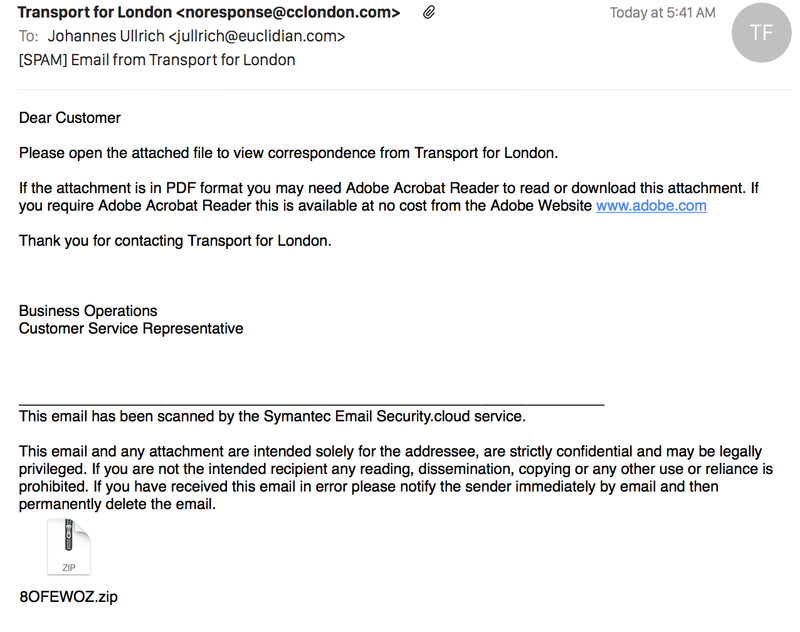 This morning, I received several e-mails with the subject "Email from Transport of London". The attacker even picked a plausible "From" address with noresponse@cclondon.com. This domain is used by Transport of London for information about London's congestion charge. Since my server (mail.dshield.org) states that it received the e-mail directly from 77.27.161.151, an apparently home user system, I doubt the second Received header is real. "Outstanding toll road payment notice"
The London Transport one was however the only one I saw that played the trick with a valid looking From address. Should the extranous mail header record not matter in the end since it validates against the latest header only and the EHLO/HELO from the SMTP server ? Correct. The received header should be ignored (as obviously, it may be forged). I wonder if whoever sent this knows about some implementations that will interpret these headers wrong, or maybe just make abuse reporting more difficult (which should also ignore this header). Received these this afternoon. Never opened them, just classified them as junk, moved to trash and the dumped upon closing Thunderbird. Interesting. I'd always imagined they could forge part of the headers, but had never seen it. I guess now I'll need to follow the received chain to make sure it's consistent.